On Monday, immersed in Game of Thrones‘ recaps and tales of LeBron’s greatness, I hit a point in the day when I needed a break from the excellent new album from the Red Hot Chili Peppers. This is not to disparage the album – at this point that seems impossible. The Getaway is really, really good and I’m excited to listen to it more. But you can’t overdue it with a new album and I think a good break point for a new album you’re in love with is after the third listen. You don’t want to over do it. At least not yet. So I was on the hunt for something else to listen to. Spotify can be the best thing for these kind of situations, although it can also be the worst. Stop sticking the Presidents of the United States into radio stations, Spotify! Literally nothing in my listening history would suggest I want to willfully hear “Peaches,” except for the numerous times you slide “Peaches” into a radio station. But like I said, it can be the best thing – not “Peaches,” but Spotify. For the most part, the bands and albums they recommend under the “discover” tab are usually pretty on point – on fleek if this was 2015. And on Monday, I noticed they were suggesting I check out the new album by a band called The Shelters. I heard about them somewhere; maybe from someone. I gave it a shot. It was a fantastic decision. 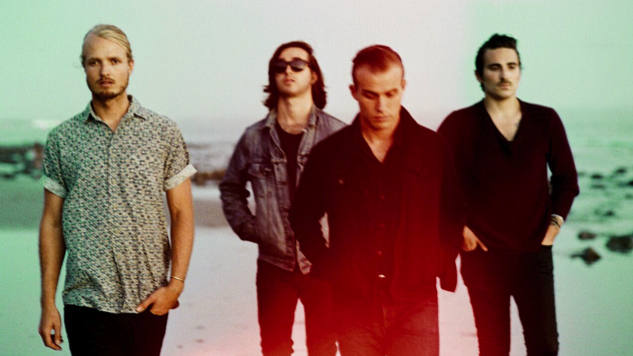 The Shelters are a four piece rock band from a little seaside town called Los Angeles. And they play rock ‘n roll – the gritty, garage rock kind of rock ‘n roll that makes you want to drink beer and hoot & holler and drive fast in an old pickup truck. Sure. They formed in 2014 and fairly early on, while playing a show in the aforementioned quaint beach community of Los Angeles, caught the attention of Tom Petty. Yes. And Petty was damn near smitten with them. So much so that he gave them a set of keys to his recording studio. The band’s two guitarists and vocalists, Chase Simpson and Josh Jove, contributed to Petty’s 2014 album Hypnotic Eye. How Many Albums Have They Released? I like their fire and their spirit. Their sound is vintage, but in a retro sense. You can hear their influences, yet those influences aren’t driving the bus. Sure there are echoes of Petty throughout the album and why wouldn’t there be? They used the dude’s gear presumably. It would then make sense that the sound is similar. But the music is more raw and fresh than Petty’s. There are also traces of early Beatles in there; especially with the lead guitar line in “Rebel Heart,” whereas “Nothin’ in the World Can Save Me From That Girl” sounds a little like the mellower side of the White Stripes and would have fit in perfectly on the Rushmore soundtrack. “Surely Burn” has one of my favorite things a good rock song can have – a garbage can-sounding stomp. Earlier in the year I thought that maybe the Record Company would be my Band of 2016, much like last year it was Royal Blood and the year before that, St. Paul & the Broken Bones and then J. Roddy Walston & the Business. But I don’t know. The Shelters might have stolen that title. We’ll see.